Cool fact: The multicolored Asian lady beetle has been given the nickname the Halloween ladybug because some of them are pumpkin orange in color along with their very round bodies and they tend to be seen in great numbers around Halloween time! Learn more about this species in our ladybug species section. Lots of great ladybug costumes for Halloween! Whether you are an adult or a child, a ladybug costume makes a fun and festive disguise for Halloween. The great thing about ladybug Halloween costumes is that there are so many different types and styles available for babies, children and adults or if you are creative you can even make your own! Last year we dressed our daughter, who was 16 months at the time, in an adorable ladybug Halloween costume. Check out all the fun costume ideas that are available below! Save on these baby & kids ladybug Halloween costumes below! Here are some really great ladybug Halloween costumes for teens and adults! Includes: Top, petticoat, bloomers, glovettes, stockings, wings and shoe clips. Does not include purse. Includes dress, headband and wings. Does not include leggings, headband or shoes. Ladybug Halloween costumes for dogs! Do you like to dress up your furry friends? If your dog will tolerate it, why not dress her as a ladybug for Halloween! These cute costumes look adorable on little dogs. 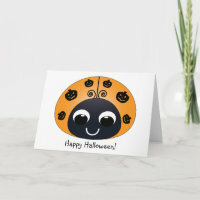 Ladybugs might not seem like a Halloween type of insect, but there are some really cute Halloween products featuring ladybugs! You can send a sweet ladybug Halloween card, or if you don't feel like dressing up in a Halloween costume, why not get a Halloween ladybug shirt to wear on October 31st! Add a special homemade ladybug Halloween decoration to your home! Click here to learn how to make your own Halloween ladybug pumpkin! It goes great with your Costume Express halloween decor, and you can make your home the ultimate Halloween house. 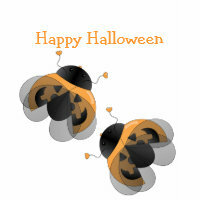 Check out all the great halloween themed ladybug products on zazzle!